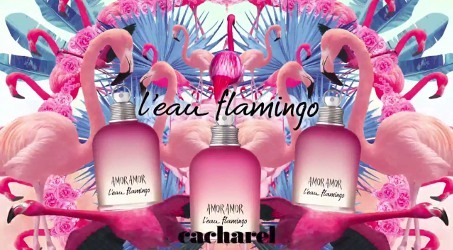 Cacharel has launched Amor Amor L'Eau Flamingo, a new limited edition summer flanker to 2003′s Amor Amor. The notes for the fresh gourmand feature citrus, cola accord and vanilla. Cacharel Amor Amor L'Eau Flamingo is available in 50 ml Eau de Toilette. I’m sorry, but “flamingo water” just sounds too much like being peed upon by an admittedly striking bird. Hahaha ewww but so great! I’m pretty sure this is no masterpiece, but how am I supposed to resist the flamingos? Yeah. There is a whole subset of perfumanity that will not be able to resist the flamingo. Only, great shame there is no flamingo on the bottle. Ha, there is a wetlands sanctuary near my parents in law and the flamingo pond smells TERRIBLE. Love the picture though. The picture made me laugh out loud the first time I saw it. It is so manic.